You'd think that the 2011 Mustang GT500 would have been a difficult car to improve, but the Shelby America and Ford SVT teams have been hard at work to prove us wrong. The recent news for the 2011 Ford Mustang GT500 is something that will be music to the ears of both Mustang and Ford GT enthusiasts, who need to carry the occasional child to school, or bag of golf clubs. While the 2010 Mustang GT500 already borrowed heavily from the wild and crazy GT500KR king of the road Mustang, the boys and girls at Ford decided to see what other potent pieces from other Ford marques they could "borrow" and improve upon. Does this Ford engine spec sound familiar? How about a 550 horsepower 5.4 liter, all aluminum supercharged V 8 with 500 pounds of torque with an 8.4:1 compression ratio, a double overhead cam; high revving heads, featuring four valves per cylinder. EPA Fuel economy is 21 mpg highway and EPA city 13 mpg. If you're an enthusiast for the Ford GT, that's a spec you might recognize as the 2006 and later GT. The 2011 GT500 Mustang features an all aluminum 5.4 liter supercharged V8 engine, producing 550 horsepower and 510 pounds of torque. Ford says that the new 2011 GT500 should achieve 23 mpg highway and 15 in the city, which is better than the Ford GT and no worse than a standard 2010 Mustang GT. This is an improvement of 1 mpg in both the city and highway numbers for the 2010 Ford Mustang GT500, which featured a 2 mpg improvement from the 2009 cars. Ford credits these improvements to weight savings from the 102 lb lighter engine and technological advances in the manufacture of the engine, which led to better reduced friction and improved heat transfer, while reducing the weight of the block by 8.5 lbs over a conventional steel sleeved aluminum block. This new technology used by Ford, uses air and electricity to create a molten plasma spray of metal nanoparticles, which are deposited onto the aluminum cylinder walls and actually reduces friction between the rings and cylinder walls, while improving heat transfer. 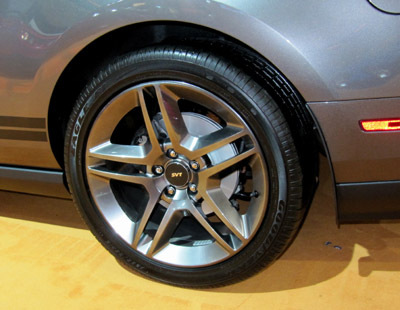 Good news for 2011 Mustang GT500 enthusiasts re some major improvements in handling, which are the result of the combination of the lighter car weight, lighter wheels to reduce unsprung weight, a lower ground height and some brand new Goodyear Eagle® F1 Super Car 2 tires. Ford engineers worked with Goodyear to produce tires specifically for this car and I think it's about time that some attention was paid to this aspect of the Mustang. Particularly since other cars, with similar performance output, not saddled with a solid rear axles, have access to much better rubber. Time will tell how much better this new combination will perform, but since the 2010 Mustang GT500 pulls .96 g on the skid pad, we may finally be seeing the car pulling into the the lofty 1.0 g territory on the test tracks. 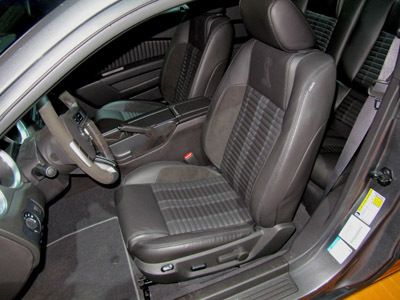 The interior appointments for the 2011 Mustang GT500 will stay mainly the same as in the 2010 GT500 Mustang, which, is excellent in both fit and finish. What you won't see, are the improvements in sound deadening,which will improve cabin noise by 20%. Chassis stiffness has been improved on both the fastback and convertible cars. Ford's SVT division states that the change in the convertible entirely changes the feel of the car, making it feel identical to the coupe. With that right foot pushing on 550 horsepower, that's great news. Everybody loves the sound of the 2010 model, but some have felt it was just a bit too reserved, so Ford set about making the 2011 car not just louder, but tuned it to sound even better doing it! Like its 2011 Mustang brothers and sisters, the 2011 Mustang GT500 will also offer the panoramic roof option for those wanting the sun to shine in, without messing up their hair. This just keeps getting better and better. 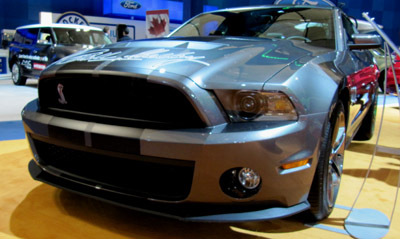 Wonder whats in store for the 2012 Mustang GT500? Tired of seeing pictures? Here's a great video showing a bright red GT500 zooming around. That's not all. Here's a video of the 2011 Ford Mustang GT 500 Convertible in action. You get the feeling that the 2011 model year is going to be a big one for Ford?